My husband and I just returned from a relaxing and fun-filled weekend in San Francisco. We had a wonderful time discovering new restaurants and revisiting old favorites, wandering around the city, and watching the Italians and Kiwis race for the Louis Vuitton Cup and the right to face Oracle/Team USA in the 34th America’s Cup which is being held in San Francisco Bay. I’ll be posting more about our trip later, but I wanted to share this recipe first. While in San Francisco, we stayed at the historic “new” Palace Hotel, which opened in December 1909, at the site of the original Palace Hotel that was destroyed by the fires that ravaged the city after the infamous 1906 earthquake. 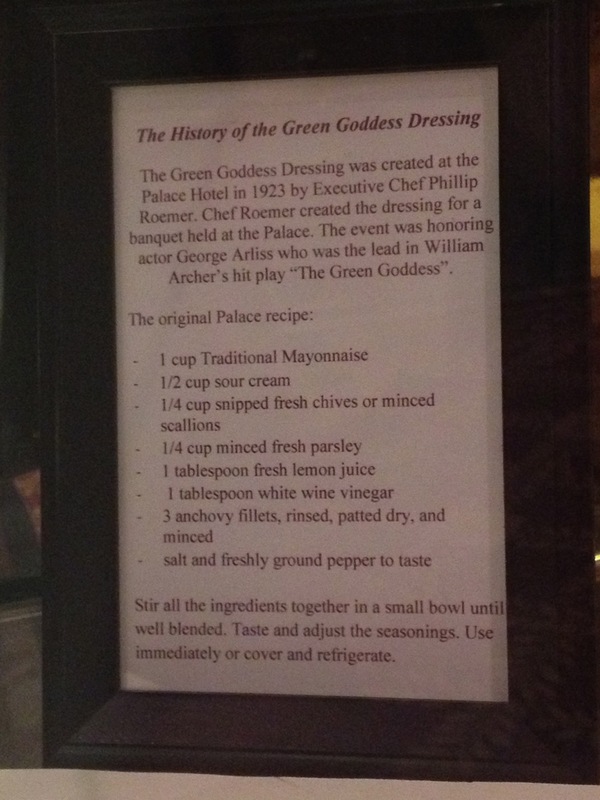 I was looking through the historical displays that adorn the hotel corridors and learned that Green Goddess Dressing was invented there in the 1920s. The hotel’s executive chef, Philip Roemer, created it for a banquet held in honor of actor George Arliss, who at the time was starring in William Archer’s hit play, The Green Goddess. After learning of the dressing’s origin, I was pleasantly surprise to see it on the menu at Flour + Water, one of the new restaurants we tried over the weekend. I jumped at the opportunity to try it and I was glad I did. One taste of the fresh and creamy dressing and I was hooked. In fact, I made it for dinner the night we got home. It was quite easy to make, and, fortunately, I had an abundant supply of all the herbs I needed growing in my garden. I used the original recipe from the Palace Hotel, but added some tarragon which I thought would work well with the other herbs. Tarragon adds an unmistakable anise and fennel flavor, which is perfect in this recipe. 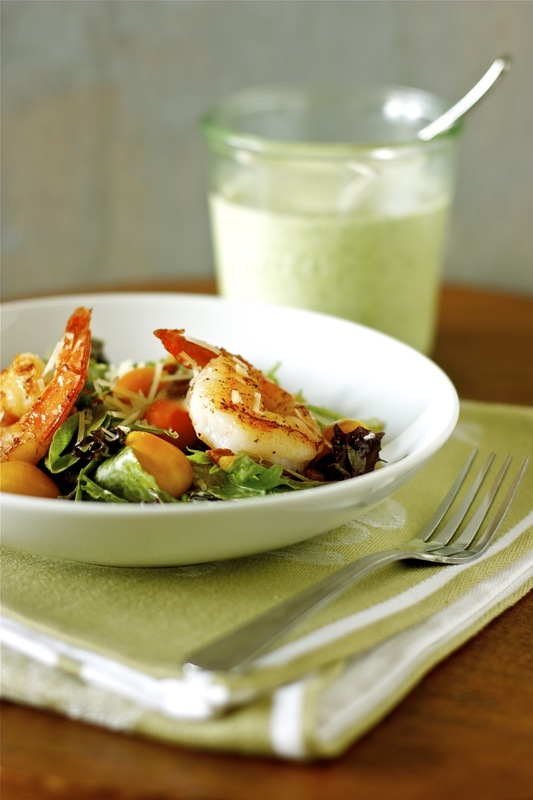 The dressing is clean-tasting and full of wonderful fresh herbs that provide it’s signature green color. The addition of vinegar and lemon juice, as well as the sour cream, adds a delicious tanginess. Don’t shy away from the anchovies; they not only add saltiness but also depth and complexity to the dressing, much like in a classic caesar salad. Green Goddess Dressing is not only great on green salads, but also on potato or pasta salads. It makes a wonderful, savory dip for vegetables and as a sauce to accompany shrimp, chicken, or poached salmon. Combine all ingredients in a food processor or blender and mix well. Taste and adjust seasonings, if needed. Cover and refrigerate. Dressing is best made several hours or up to a day ahead. Adapted from Executive Chef Philip Roemer, Palace Hotel. Yum…. Daisy can i please ask you to view and like something? It’s my latest blog post on http://www.junkfoodjournal.com. I would love if you would consider Reblogging this. I will return the favor! Trying to win something very near and dear to my heart, and although i have lots of facebook friends and some blog followers, i need the big heart of someone bigger to get me to where i need to be! You can learn all about me in the About Me section of my blog. It will be good karma for you! 🙂 pleeeeeaaase just take a look and think about it? I liked your youtube video. Well done! Good luck. i have been wanting to try making this dressing! thanks for the recipe! looks great! Jess, there are many variations, some with avocado or different herbs. This one is close to the original recipe, as you can see. I hope you like it. 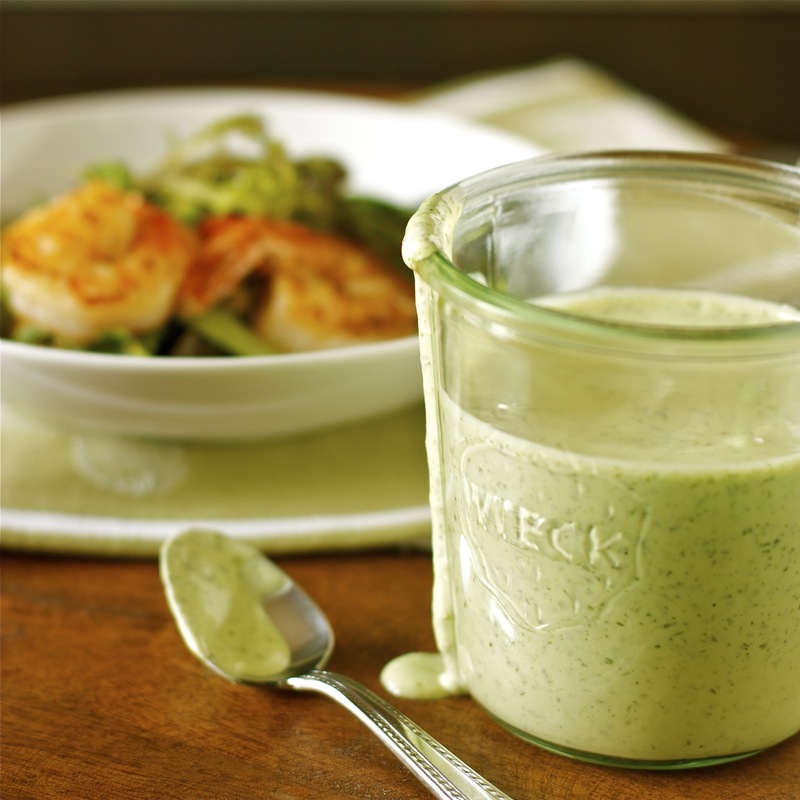 Green Goddess Dressing has never looked so good! (That first picture is perfectly gorgeous. Oh, yes, and the second one too.) My husband is in the San Francisco area right now. How jealous am I? Thanks, Michelle. You should have made some excuse to go with your husband and wander around the city while he’s off doing whatever he’s doing. Green Goddess is one of my absolute favorites. That you used anchovies makes me so happy. Very Roman. Also, look at you using Weck. Pure class. 😀 GO Daisy! Janet, I can’t imagine making this dressing without anchovies. It just wouldn’t be as good. Anchovies give it a nice savory flavor and depth without being overpowering. Thank you for your kind words. P.S. I do LOVE my weck jars. I don’t do any canning, but I use these jars for most everything else. So glad you enjoyed your weekend by the bay! I’m serving arugula green goddess dip at a party on Saturday! And tarragon is a must! Hi, Margie! Yes, we certainly enjoyed our short visit to San Francisco. It’s such a lovely city. I was surprised that the original Palace Hotel recipe didn’t have tarragon since it’s so good in it. I just assumed that it would have it. I am so happy you posted this. I love green goddess dressing. And I had no idea it came out of the Palace Hotel! Thank you. I didn’t either. The Palace Hotel is so beautiful and historic. Next time, I’ll try their Green Goddess salad.